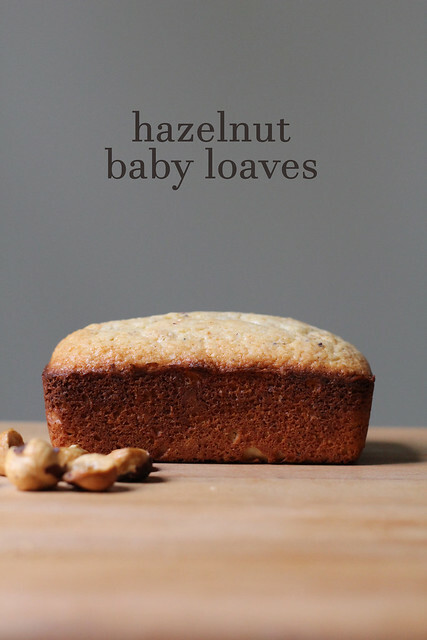 For all the yapping I did last week about wanting my own dessert, I have to admit that I shared one of Johanne Killeen’s individual Hazelnut Baby Cakes. It wasn’t that I didn’t want a whole little loaf cake all to myself…it’s just that a mini loaf is actually kind of a lot of cake. These mini loaves were easy to make. I did take them out of the oven a few minutes before the time noted in the recipe, and I did replace one tablespoon of butter with this lovely hazelnut oil that I bough a while back to use in vinaigrettes and keep forgetting about. Other than that, I followed the recipe as-is. I was pleased to use my mini loaf pans, which almost never see the light of day. The cakes themselves aren’t too sweet, so it’s nice to serve them with a little something. 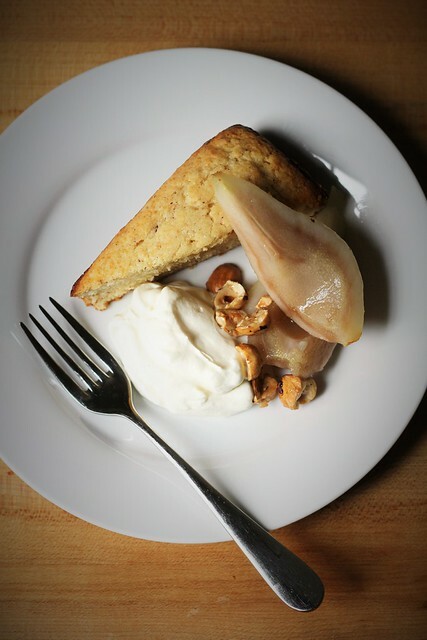 In addition to the suggested mascarpone-whipped cream (sans grappa, thank you), we had our baby cakes with poached pear slices and candied hazelnuts. Speaking of that cream, after I made my husband a birthday cannoli cake a few months ago and frosted it with mascarpone whipped cream, I decided that adding a nice blob of mascarpone is the best way to stabilize whipped cream. It’s light, tastes delicious and holds up perfectly for a few days. I highly recommend. For the recipe, see Baking with Julia by Dorie Greenspan. There’s also a video of the TV episode. Don’t forget to check out the rest of the TWD Blogroll! Those baby loaves are so cute and so delicious! I love reading your post. Full of wonderful ideas and tips. Why didn’t I think of using hazelnut oil? Mascarpone to stabilize whipped cream, another great tip. Your cake looks tall and regal. Yum!! I could definitely eat a whole one of these loaves!